Come and enjoy King High's outstanding all-weather facility! We desire to put on a "varsity quality" invitational for your frosh soph athletes. Too often, the "stars of the future" are eclipsed by today's standouts. Our meet gives the stage over to the up and comers, and provides them an opportunity to be treated to a high-class, well run meet with all the perks and benefits of varsity-level meets. With custom-designed, unique "see-through" medals, full snack bar, automatic timing and seeding, program and t-shirts, nothing is downsized in the absence of varsity athletes. Partnering with Dyestatcal.com, we'll provide your frosh-soph athletes showcased results and photos, indeed a rarity in the varsity dominated meets on any weekend. In short, we're working hard to put on a great meet for you and for your athletes! We look forward to an exciting and well-organized event that your athletes will long remember! Awards: New custom made 3D type medals for the top performances of the day in each event including relays will be awarded. Places 2 through 6 in the individual events and 2 through 6 in the relays will get the meet’s traditional custom-made medals. This year we are adding something new in that we will be giving medals to heat/flight winners in the slower heats or field event flights with the lower marks. There will be trophies for top three teams in each division and a sweepstakes trophy for the team with the highest combined boys and girls score. Team Scoring: Team scoring 10-8-6-5-4-3-2-1 format. In this way, more kids have a chance to contribute to the team scoring. Coaches, please understand that you MUST have payment the day of the meet. You will be required to pay for your entry fee with a personal check or cash, even if "Your check is in the mail". Finished Results will be handling our timing. Go to the Finishedresults.com Each school is allowed four entries in every event. Entries will open online on Sunday, March 1 at 8 AM. Spectator Gate/Ticket prices (cash only): Coaches, please advise parents and spectators! Track Events schedule: We will be going CIF Order of Events beginning with the 4x100 relays at 9 am. Also, the 3200 heats will take place at their normal spot in the event order. This means we may have at least two heats of the boys and girls 3200. All heats and flights are FINAL races and field events will be seeded with the best times/performances being in the last heat or flight for that event. PLEASE IMPRESS UPON YOUR KIDS THE NEED TO CHECK IN ON TIME! Athletes can be substituted in place of a previously entered competitor (unless it’s a final race in which athletes ran prelims) but they must run under the name of the person they are replacing. If you wish to run “B” relays or add competitors to field events, please see the Meet Manager before the meet is under way. After that we cannot accommodate you. ONLY 3/16 INCH NEEDLE SPIKES ARE ALLOWED ON THE TRACK. Athlete’s spikes will be checked upon entrance into the facility and again at the clerk of the course. 3/16 inch needles spikes will be available for purchase at the athlete’s entrance and must be in place on the shoe prior to entrance into the facility. Athletes who come to the track with any other spike but 3/16 NEEDLES will be denied participation. NO FOOD, GUM, OR DRINK OTHER THAN WATER IS ALLOWED ON THE TRACK OR INFIELD AREA. Any athlete found in violation of this rule forfeits further participation or any awards they may have earned. Be aware that parents LOVE to hand their kid a Gatorade or other flavored drink over the fence once they finish a race. Water is fine, but that’s it. Aside from the normal rules for disqualification (see NFHS rulebook) meet management will disqualify athletes or teammates of said athlete based on the following offenses. · Athletes who have food, gum or flavored drinks on the field. · Athletes who do not “declare” at the declaration table prior to check in or who do not “check in” at the check-in table on time. A variety of food and beverage items will be available for purchase throughout the meet. Complimentary lunch tickets will be provided for coaches. A Coaches Hospitality room will be available in classroom G123 in the building directly behind the Press box for coffee, juice, donuts and shop talk prior to the meet. Coaches will check at the stadium press box to pick up packets. The King High School Trainer and King Student trainers will be on site. Please bring your own tape and under wrap if they wish to get taped. Athletes need to come dressed for competition, there are no locker room facilities. You may enter up to three athletes per event if you have them. We will consider four entries in the distances. We will seed heats with athletes of like times and performances and athletes with the fastest times will be in the last heat for that event. This is for all events but the 100-200 and 110/110 hurdles as we will have early qualifying heats in those events. If on the day of competition, you would like to replace a competitor, you may do so but the athlete you move into their place may only run in the race of the athlete they are replacing. In the event of a rainout, there will be no makeup date and we will attempt to refund as much of your entry fee as feasible. If you have any questions please get in touch with John Corona the Meet Director, as soon as possible. 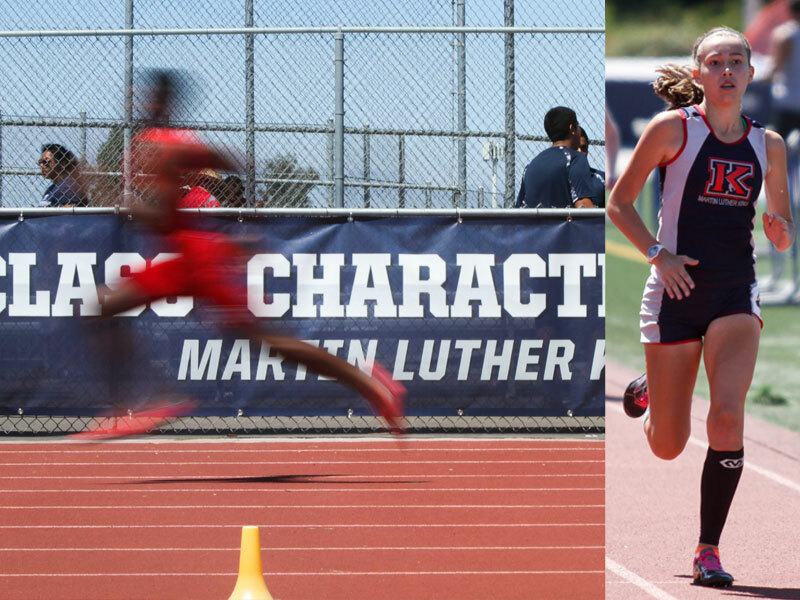 Rancho Verde's boys and King's girls dominated the day in the 11th running of the King Frosh Soph Classic. With 16 schools competing, the two teams' dominant performances made the victories a bit of a runaway on both sides. Rancho's boys sprint crew was just outstanding. Rasam House, Tyler Kennedy and Carson Walder went 1,3, 5 in the 100 and House doubled back to win the 200. In the 4x100 relay, they won that event as well over Heritage and King squads. Rancho Verde's 4x400 relay group came within a second of taking the meet record with a very impressive 3:32.69 victory. Their talented 400 meter runner, Isaiah Robertson did set the meet record in the 400 running 50.81. Cameron Samuel won the 300 hurdles in 40.81, with his teammate Henry Banks coming in third. A second meet record was set by Rancho Verde's Bryan Thompson who skied in the long jump, landing at 21-04, 8 inches past the old mark set back in 2010! Alijah Holguin was fifth in that event to score as well. King's boys finished second in the race, but with the dominance of Rancho Verde, the scores were not close. Solid performances were turned in for the Wolves in a number of events. Carson Walder finished fourth in the 100 meters, going 11.91. Dillon Lay and Josh Fisher ran really well in the 110 high hurdles, finishing in 2nd and 3rd respectively, and they came back to match that in the 300's, finishing 2nd and 4h. Blake Gelinas couldn't match the record-setting mark in the 400, but did run 53 seconds to take second place. Jeremy Young scored a point in that event coming in 6th place. Austin Dai ran one of his grittiest performances ever in the 3200, finishing 4th in 10:34. Noah Gutierrez finished fourth in the high jump while Andrew Wilde won the pole vault at 11 feet. Where the boys of Rancho Verde ran away with it, the girls of King returned the favor and ran away from Rancho Verde, finishing with 156.5 points, to Rancho's 89. The Lady Wolves seemed to have mastery over almost every event. Rebekah Pendleton won the 3200 in a hard-fought battle, while Allison Janes and Kathryn Hammar went 1-2 in the 1600 meters. Sarah Anne Frank did really well in the hurdle races, winning the 100's and placing third in the 300's. Sydney Reid dashed her way to second in the 100 meter dash and first in the 200. She was followed in the point scoring by Larisa Cesena and Charizma Guzman, both of whom scored in the 200 meter final. The Wolves 4x100 team was victorious. Freshman Ashley Chruszcz was second in the 400 meters. In the 800 meters, Tayelee Holtrop and Hammar finished 4th and 5th with solid performances, but they were outshined by the freshman phenom from Riverside Poly, Kalea Ybarra who went wire-to-wire unchallenged and still managed to set the meet record at 2:16.98. King's Areena Zavala won the shot put with a heave over 30' while Keiana Turner scored in 4th place. Turner would double back to win the discus, however, with a toss out over 88'. So it was a day for sharing the top 2 spots of the day, as Rancho Verde and King went 1-2 and 2-1 in the team scores. 2007 KING FROSH SOPH CLASSIC GOES INTERNATIONAL IN STYLE!